"You've got spam! It's not mail!" 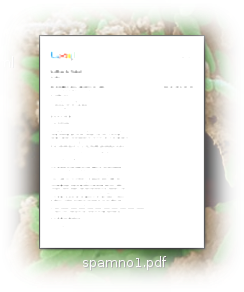 (Futurama) I've just received my first spam on the email connected to this blog - weee! Spam has become an every day matter to some of us website administrators (bloggers count as well!). Spammers are usually paid for their services, or they are website administrators advertising and populating their webtraffic using a costless, yet very effective way. Their spelling errors are sometimes deliberate to get through spam detectors, so in my opinion, that "you have be picked" has a purpose. As I've explained in this post, there are a number of reasons to choose gmail as your main email address or your "spam layer" as I like to call it. My reply was: "I hereby declare that this is marked as spam throughout gmail :) have a nice day!" If you read the spam mail you'll understand why.